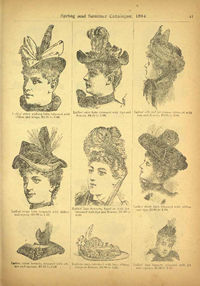 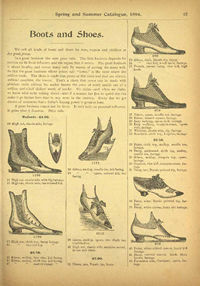 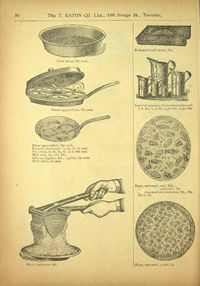 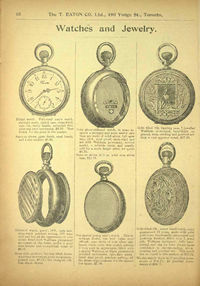 184 pages of Fashion and Lifestyle products from 1894. 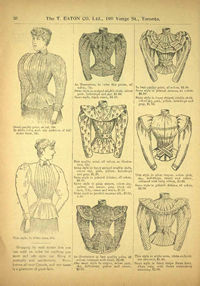 Dress Goods Department, Linen Department, Ladies’ Underwear Department, Cloak Department, Blouses, Ladies’ Underskirts, Children’s Dresses, Infants’ Dresses, Infants Cloaks, Waterproof Cloaks, Children’s Reefer Jackets, Millinery Department, Gloves, Ribbons, Laces, Hoisery, Ready-Made Clothing Department, Men’s Furnishings, Boots and Shoes, Watches and Jewelry, Stiffened Gold-Headed Presentation Canes, Cabinet Clocks, Silverware Department, Musical Goods, Patent Medicine Department, Toilet Department, Patent Medicines &c., by Mail, Grocery Department, Artists’ Materials, Basement Department, Tinware, Gas Stoves, Granite Ware, Baking Cabinet, Refrigerators, Brushes and Woodenware, Boys Velocipedes, Girls Bicycles, Waggons, Lawn Croquet., Lamps, Baskets, Crockery, Glassware, Trunks and Valises, Baby Carriages, Scales, Lace Curtain Department, Curtain Fabrics, Curtain and Upholstery Fabrics, Cornice Poles and Brass Trimmings, Window Shades, Spring Shade Rollers, Mats and Rugs, Carpet Department, Wall Papers, Furniture Department, Pictures, Mirrors, Book and Stationery Department, Spectacles and Eye-Glasses, Bicycle Department. 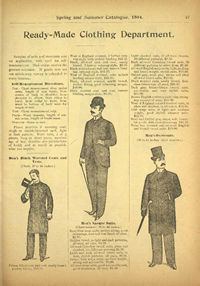 File Size : 25.8mb approx.